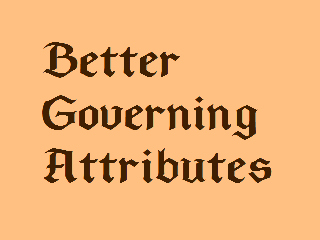 Changes which attributes are the governing attributes for certain skills. Security is affected by Agility and has nothing to do with spellcasting or magicka, which is what Intelligence affects. I wanted all classes to have access to an Endurance building skill, since it affects maximum health; so I just made all the armor skills be governed by Endurance. Additionally, it's logical for light and unarmored characters to build up physical resistance at least as fast as heavy armored characters, since they'd actually be getting hit harder. Spear, on the other hand has nothing to do with maximum health, so I moved it to Strength, same as the other large melee weapons. Acrobatics has nothing to do with Strength, but is more effective with a higher movement speed, so I moved it to Speed. Speed doesn't really enhance the use of the Short Blade skill, so I moved it to Agility, which affects weapon accuracy - something that is especially critical when backstabbing. Finally, I felt that there should be another spellcasting skill under Intelligence so I moved Mysticism there. Many of these changes are consistent with Oblivion's governing attributes. If you don't like my changes, but don't like the vanilla either, its very easy to create your own governing attributes mod in the construction set. Simply create a new plugin (.esp file) and go to Character > Skills. This mod changes very little, so there shouldn't be any compatibility issues, except with other mods that do the same thing. To Install, just download the .esp file and add it to Morrowind/Data Files and enable it. Feel free to use or distribute this file however you want.